Introduction: Although rare, some pediatric diseases may require diagnostic and therapeutic endoscopic retrograde cholangiopancreatography (ERCP). 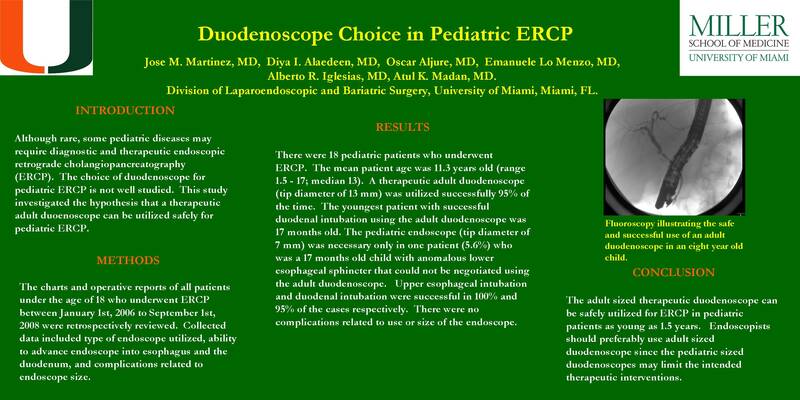 The choice of duodenoscope for pediatric ERCP is not well studied. This study investigated the hypothesis that a therapeutic adult duoenoscope can be utilized safely for pediatric ERCP. Methods: All patients under the age of 18 were included in this study. The charts and operative reports of all patients who underwent ERCP were retrospectively reviewed. Collected data included type of endoscope utilized, ability to advance endoscope into esophagus and the duodenum, and complications related to endoscope size. Results: There were 18 patients who underwent ERCP between January 1st, 2006 to September 1st, 2008. The mean patient age was 11.3 years old (range 1.5 – 17; median 13). A therapeutic adult side-viewing duodenoscope (tip diameter of 13 mm) was utilized successfully 95% of the time. The youngest patient with successful duodenal intubation using the adult duodenoscope was 17 months old. The pediatric endoscope (tip diameter of 7 mm) was necessary only in one patient (0.06%) who was a 17 months old child with anomalous lower esophageal sphincter that could not be negotiated using the adult duodenoscope. Upper esophageal intubation and duodenal intubation were successful in 100% and 95% of the cases respectively. There were no complications related to use or size of the endoscope. Conclusions: Adult sized therapeutic duodenoscopes can be safely utilized for ERCP in patients as young as 17 months. Endoscopists should preferably use adult sized duodenoscope since the pediatric sized duodenoscopes may limit the intended diagnostic and therapeutic interventions.